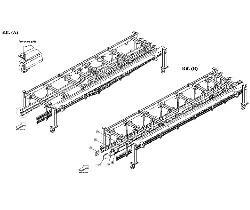 This upgrade consists in supplying the necessary equipment for a quick change of the product guides on the machine infeed conveyor. 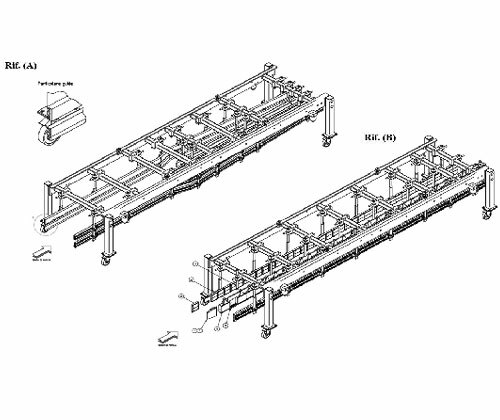 The equipment includes a frame for moving the guides and their support; the whole block is easily positioned and fixed onto the infeed conveyor by means of a pulley (not supplied). The new system offers considerable advantages, since the operator no longer needs to adjust the position of the guides every time he makes a change-over. The equipment is pre-arranged for each format and is adjusted according to the product to be packed, be it loose or already packed (with film or in cardboard boxes). NOTES: the picture "Ref. A" refers to a general group for a quick change of the guides for loose product; the picture "Ref. B" refers to a general group for packed products. If not specified, this offer does not include the installation and start-up of the new format (both concerning the parameters and the equipment), nor the technical support (both on site and from SMI). This upgrade is subject to technical check by the spare parts department. - The product guides are adjusted once, at the first start of the format, then they are no longer modified. Therefore the precision of the adjustment is guaranteed.